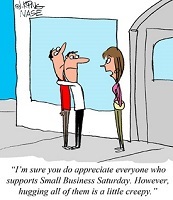 Small Business Saturday takes place this weekend on Nov. 28! In 2014, 63 percent of net new private-sector jobs were created by small businesses. Last year, Small Business Saturday sales surpassed $14.3 billion. Make sure you support SBS by shopping local! Mental health professionals classify burnout as the complete mental, emotional, and physical exhaustion that results from prolonged stress. Burnout can cause depression and anxiety, as well as detachment, lack of enthusiasm and disengagement from work and life. Fortunately, business burnout is completely preventable. But how can you keep it at bay? Believe it or not, it can be done – you can have peace, success and happiness. But it takes some willpower and self-care, both inside and outside of the workplace. MISSED AN ISSUE OF SELF-EMPLOYED OUTFRONT WEEKLY? VISIT AND SEARCH THE ARCHIVE TODAY.